The Justice League, formerly also called the Justice League of America or JLA, is a fictional superhero team that appears in comic books published by DC Comics. 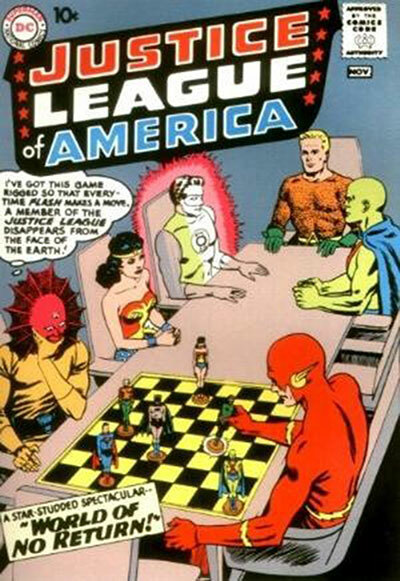 First appearing in The Brave and the Bold #28 (February/March 1960), the Justice League originally featured Superman, Batman, Wonder Woman, Flash, Green Lantern, Aquaman, and the Martian Manhunter. The team roster has been rotated throughout the years with characters such as Green Arrow, Captain Atom, Captain Marvel, Black Canary, the Atom, Hawkman, Elongated Man, Red Tornado, Firestorm, Zatanna, Hawkgirl, Cyborg, Vixen, and dozens of others. Sidekicks like Supergirl, Robin, Aquagirl, and Speedy tend to support the main hero or heroine. 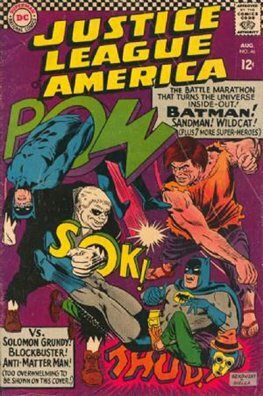 The team received its own comic book title in October 1960, when the first issue was published. It would continue to #261 in April 1987, which was the final issue. 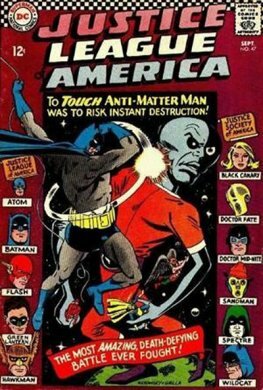 Throughout the years, various incarnations or subsections of the team have operated as Justice League America, Justice League Dark, Justice League Europe, Justice League International, Justice League Task Force, Justice League Elite, and Extreme Justice. Fox - Sekowsky - Greene "The Bridge Between Earths!"